“Leave it to the Early Church”- A Young Earth challenge | J.W. Wartick -"Always Have a Reason"
It’s no secret: I consume just about any book I can get my hands on related to the debate over the duration and means of creation within Christianity. Recently, I read through Three Views on Creation and Evolution, part of the Zondervan Counterpoints series. The young earth creationists (John Mark Reynolds and Paul Nelson) in this volume were more even than many I have read, and I appreciated their contribution in many ways and even found myself agreeing with portions of it. However, they did make a few remarkable claims, one of which will be my focus here. Namely, they suggested we leave interpretation of Genesis behind us and just assume the early church got it right. I find this simply astonishing! There are a number of reasons to reject this entire line of reasoning immediately. First, it is, in effect, poisoning the well. Second, it abandons any notion that new evidence can challenge established traditions. Third, it begs the question. Fourth, it undermines the need for the church to be semper reformanda – always reforming. We’ll examine these briefly in order. The way Nelson and Reynolds present their argument poisons the well against any who would disagree with them. The insinuation is that the only reason anyone would come to a different conclusion is either because they don’t have an “educational” background which allows them to consider traditional readings or because they are in such a hurry to compromise the text to align with science. Although it is certainly possible that many readings come from these motivations, to suggest that we must put a ban on any future looks at the interpretation of Genesis shows the authors seem to think these motivations apply to all novel interpretations. To put an interpretation of Genesis on an indisputable pedestal and say “that came from a ‘saner’ time and so we must follow it” undermines any possibility for new evidence to challenge established readings. Yet the fruit of research in many areas of biblical interpretation continues to yield great insight into the biblical text. Moreover, to make an interpretation like that indisputable is to perhaps set up stumbling blocks for future generations, who may in good faith find more evidence which challenges that interpretation. By saying we need to leave the interpretation of Genesis to the past, Reynolds and Nelson have begged the question by assuming this interpretation is correct. In fact, they seem to assume it is so obviously correct that they don’t even bother to defend it. But of course this is not how theology ought to be done. We should not just relegate interpretations to the ecclesial past because we don’t want to face the challenges of today. Rather, we should explore the new evidence and new interpretations to see if they might in fact better match God’s revealed truths. By simply assuming we can leave an interpretation of Genesis as is, Reynolds and Nelson just assert their view is obviously correct without argument. The notion that the church needs to continually be reforming seems to be correct. When we find truths revealed in God’s natural revelation, we should be prepared to realize this may not align with our established paradigms. We need not reject these discoveries merely because the historical church didn’t know about them. Instead, we should realize that as an imperfect church waiting for our Lord’s return, we may get things wrong. We are always going to need to reform. Thus, I think that any young earth creationist who simply asserts we must hold to the historic understanding of the text of Genesis is mistaken. Of course, I would also point out that the “historic” understanding is hardly what the modern young earth creationist would believe (such as the duration of the entire universe only lasting 6000 years in order to align with the creation days, etc. ), but that is a matter for a different post. For now, it should be acknowledged that we should not just abandon attempts to understand God’s revelation in Genesis. Origins Debate– Check out all my posts on the discussion within Christianity over the duration and means of creation. 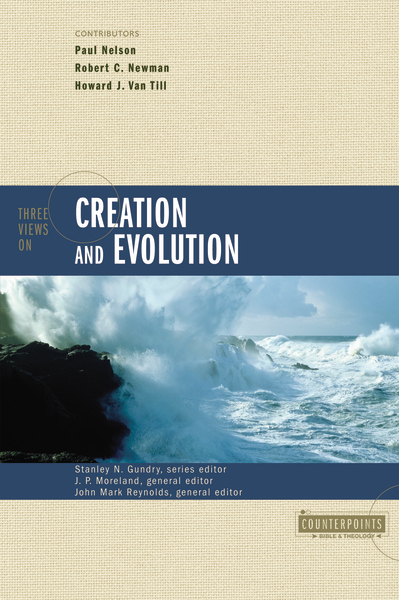 Paul Nelson and John Mark Reynolds, “Conclusion” in Three Views on Creation and Evolution edited by J.P. Moreland & John Mark Reynolds (Grand Rapids, MI: Zondervan, 1999). I recommend Seven Days That Divide the World by John Lennox. We boldly profess, at times, to be sincere Bible-Believing Christians genuinely committed to searching the Scriptures ‘to prove all things’ and ‘hold fast that which is good and true’ (1Thessalonians 5:21). Yet, very often, we somehow choose to remain enslaved to erroneous traditional church beliefs even when the same are found to contradict the plain Scriptural teaching. By all means, Tradition and Dogmas reign supreme in our hearts and minds influencing thereby our convictions and beliefs just as it was in the bygone dark ‘Middle Ages’. In the process, we end up behaving like religious fanatics. And then, we make it our Mission to criticize those who actually preach sound Biblical Truth. We unjustly label such, given our inherent prejudice, as heretics because what is preached by them seems to have no supportable base in church history; or, because what is taught by them is found to contradict our traditional doctrines and ‘hide-bound’ beliefs and concepts. The way I always look at it is that God is truth, and truth will always point to him, wherever we find it. We should never be afraid to discover truth, and God is certainly capable of answering whatever question we might come up with. I would like to take issue Dr. Ryrie’s quote that Mr. Martins supplied that “The truth or untruth of any doctrine does not depend on whether or not it was ever taught in church history. Its truthfulness depends solely on whether or not it is taught in the Bible.” This is helpful to the extent that it is clear what is taught in the Bible, and we all know that there are great debates raging today on what is clearly taught. The writings and councils of the early church to the Reformation, dealt with many issues of orthodoxy and are very helpful in determining the true reading of scripture. Many, if not all, of the heresies we see in our churches today are not new and were dealt with specifically at various times in the past. Also, there has never been someone that is not influenced by their culture and traditions and it is wrong to assume that the early church was only influenced by correct scriptural beliefs. I mean, a cursory reading of the New Testament shows the massive problems they were dealing with, in many ways parallel to our churches today. There is great value in pursuing how historical Christianity dealt with theological issues and this should be encouraged. That being said, the position that John Mark Reynolds and Paul Nelson take is foolish and naive. I found the YEC section of this book to be rather refreshing, as Paul Nelson and John Mark Reynolds stood their ground in what they believe, and yet did so with grace and humilty. They did not take the my-way-or-the-highway approach of many YECs. They state, Natural science at the moment seems to overwhelmingly point to an old cosmos. Though creation scientists have suggested some evidences for a recent cosmos, none are widely accepted as true, and Recent creationists should humbly agree that their view is, at the moment, implausible on purely scientific grounds. Statements like these won’t earn Nelson and Reynolds any points with some YECs.